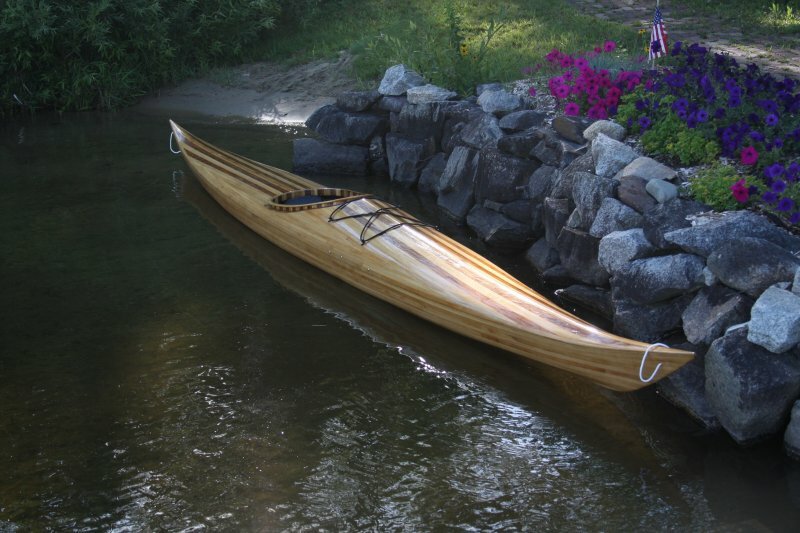 I started this boat by buying a load of rough cut northern white cedar from a small family run sawmill in Danville Vt. Working from a set of full size plans and Nick Schade’s two books (The Strip-Built Sea Kayak and Building Strip-Planked Boats) I proceeded to build the moulds and strongback. I kept the deck design simple as this was my first boat. The deck uses western red cedar accent strips. This was my first time in using fiberglass. My biggest challenge was getting the epoxy to cure in the cool New Hampshire spring. I next plan on building a wooden paddle (the plastic one just doesn’t make it).